Thanks so much for downloading Weav Run! The following is a step-by-step guide to help you set up your playlists and start running with the app. Learn all about Weav’s features below, and if you have something to add or questions we can help with, leave us a comment. To get started using the app, select the app icon from your home screen. To begin, connect to WiFi and music will automatically start downloading for you. We recommend downloading at least one full playlist—but the more the merry!—before going for your first run with the app. ‘Weav Favorites’ features several curated playlists. Looking for the newest adaptive songs on the app? Check out the ‘Fresh’ playlist. Need music to push you through a treadmill session? Cue up ‘Dreadmill.’ Too many voices in your head? Try the ‘Speechless’ playlist that features songs without lyrics. First, give your playlist a name. Find more music for your new playlist! 2. First, select your location type. If you select the ‘Indoors’ setting, it’s assumed that you’ll use the app without GPS tracking. And you’ll be prompted to input the distance of your run at the end of your workout. Use this setting on a treadmill or inside running track. If you use an Apple Watch, Weav Run will track indoor distance with your watch. Check out Apple Support’s guide for more about indoor tracking with Apple Watch. 3. Then, select your music mode. MATCH MY STRIDE: Weav keeps the music in sync with your steps while you’re running. Take more steps/minute, the music speeds up. Take fewer steps/minute, the music instantly adapts and sounds slower. FIXED TEMPO: Weav keeps the song’s BPM (beats per minute) constant. Use this mode to help maintain a steady rhythm while running by matching your steps to the beat. This mode can also be used to help optimize your cadence (steps/minute). To learn how to fine-tune your cadence, check out this article: How To Improve Your Running Cadence. Scroll and select which playlist you’d like to listen to during your run. If you created your own playlist, if will appear at the top of the screen. If you selected the ‘Match My Stride’ mode, TAKE OFF and experience the magic of adaptive music! NOTE: To skip a song while you’re running, simply swipe left. And to repeat a song, tap the song title and it will return to your queue. Once you’ve set your stride rate, hit ‘Start’ at the bottom of your screen to begin tracking and TAKE OFF! 6. Save and complete your run. Hit ‘Stop’ and then ‘Finish’ to save your run. 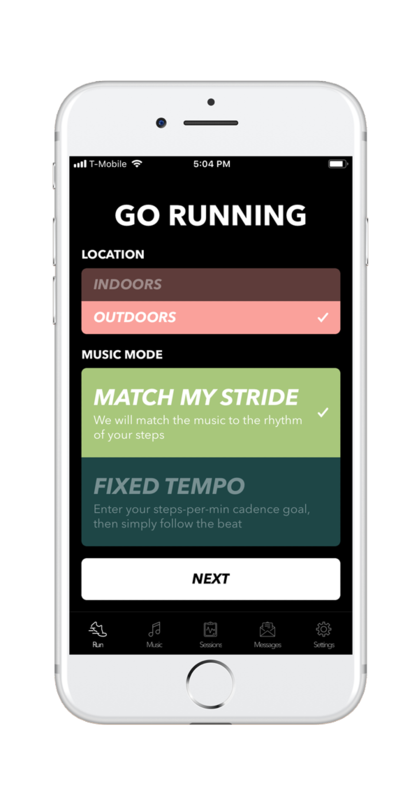 You can attach a photo to your run, edit the title by tapping the x to the right of the music description, and add a note about your activity as well. Each run you save on Weav Run will appear on the ‘Sessions’ tab located on the bottom navigation bar. Keep track of and analyze your running data, like average cadence, total minutes of running with adaptive music, and more. 8. Don’t forget to share your run! Use #weavrun on social media—share, share, share! Tap whichever social icon you want, and Weav will automatically open that app and you can complete your post. Use #weavrun when sharing so we can following along too! For more information, be sure to check out our FAQ page. Also, check out our ‘Music Tutorial’ under the ‘Settings’ tab on the app. If you have questions or concerns, please don’t hesitate to reach out via the app. Under ‘Settings’ tap ‘Help & Feedback’ and let us know how we can help! Or shoot us an email at yourfriends@weav.io. Thank you so much for using Weav Run! We think you’re going to LOVE running with adaptive music.